In today’s interview, cardiovascular research scientist, Dr James DiNicolantonio, is back to explain how different dietary fats affect us and which fats we should be consuming more of. You may remember James from our previous episode (Episode 9: Beneficial Effects of Salt on Blood Pressure (+ More)) where he talked about the benefits of salt and completely turned the commonly held beliefs about salt on its head. 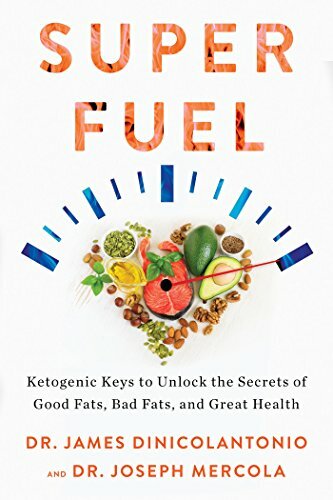 In today’s interview, we get a chance to talk about research that went into writing his new book: Superfuel: Ketogenic Keys to Unlock the Secrets of Good Fats, Bad Fats, and Great Health. If you have reached a plateau with your weight loss or have been feeling sluggish on the keto diet, James explains what some of the causes might be and shares great tips on resolving these issues. He also shares some great advice on oxidation, dealing with environmental pollutants and ensuring you are getting enough omega-3s and other beneficial nutrients for optimal health. 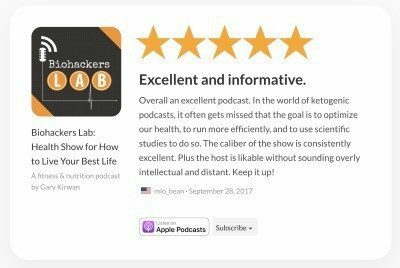 If you know someone who is interested in finding out about the effect of different dietary fats on our bodies, as well as what fats we should be consuming (especially on keto), this interview is for them. I enjoyed this interview with James as he taught me about some critical things to consider when choosing which type of fat (or oil) I cook with and consume on a daily basis. Special thanks to James for joining me on the show. Enjoy the episode! To find out more, visit James on his new YouTube channel or follow him on Twitter, Instagram or Facebook. 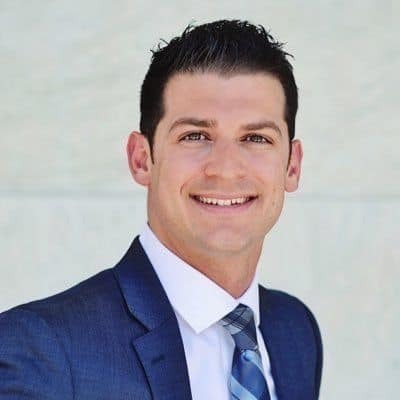 [00:19] – Introducing, Dr James DiNicolantonio, who was on a previous episode talking about his book: The Salt Fix. He is a doctor of pharmacy, a cardiovascular research scientist and associate editor for the British Medical Journals (BMJ) Open Heart and Nutrition. He has a new book coming out with Dr Mercola called Superfuel filled with their research and discoveries about good fats vs bad fats. [01:14] – James’ own experience with the keto diet inspired him to write this book. He was making mistakes in regard to what fats he was using (especially in terms of weight loss), and he believes there are others who are making similar mistakes. Getting this aspect right is key to success on the keto diet. [03:15] – James explains how this book explains where the thinking behind animal fats being harmful to health and vegetable oils being good came from and why it is wrong. The story begins with the invention of the cotton gin; James explains how partial hydrogenation was invented to create a fat from vegetable oils that looks like animal fat at a fraction of a cost. [06:30] – Ancel Keys’ Six Countries Study (in addition to his Seven Countries Study) propelled the myth that animal fats were bad by leaving out 16 other countries. [08:53] – Are some vegetable oils better than animal fats? While Omega 3 ALA’s may have some advantages over long chain saturated fats, you still need to get them from whole foods. Once extracted they are highly susceptible to oxidation due to high levels of polyunsaturated bonds. [10:37] – One of the benefits of ALA, over long chain saturated fats, is that it’s a ketogenic substrate. The monounsaturated fats, like the oleic acid found in avocado and olive oil, also have certain advantages, e.g. the amount of energy you burn to metabolise these fats is twice that then for long chain saturated fats. [12:59] – In addition, the energy from nuts, olives, and avocados is not stored and is released straight away so you have more energy from eating those foods. James explains how the fats that you eat may actually determine how active you are. [14:22] – Different fats activate different genes. Studies show how replacing fat from a steak with fish oil results in a replacement of fat with muscle; this is due to the long chain marine omega 3 like DHA and EPA (found in wild salmon) activating the fat burning gene. [15:27] – Sources high in omega 3 ALA’s are nuts, seeds and green leafy vegetables. While there are health benefits to pasteurised butter (source of vitamin K2), overdoing the butter and bacon can lead to a feeling of sluggishness. James explains there are better sources of food, that studies show, improve weight loss. [18:06] – Olive oil is very high in polyphenols which prevent oxidation of that oil, which is why extra virgin olive oil (EVOO) can be extracted safely. For this reason, it is also the best oil to use for cooking; the oils with the highest smoke points are the most refined and oxidise very easily. EVOO is not only safe, it is beneficial as it dramatically reduces advanced glycation and other harmful substances forming; James always coats his meat with organic EVOO when grilling meat! [21:33] – It is also completely fine to cook with butter or lard. James rates EVOO as number one with coconut oil, and fats like butter, ghee, lard and tallow a close second. He notes there is a potential of the cholesterol in animal fats oxidising, but saturated fat tends to protect it. [23:00] – The key takeaway is to think about oxidation. Bad fats oxidise more easily, a fat high in omega 6, or omega 3 oil will be the worst when it comes to cooking for this reason. James explains what oxidation actually means and why this is harmful to us. [26:43] – Individuals could experience some negative results when they start to lose weight on a ketogenic diet as they start to release some of the stored linoleic acid (and the persistent organic pollutants), especially if there is not enough omega 3 to suppress the inflammation. To combat this James recommends consuming whole food fibre. Alternatively, medication such as cholestyramine also works. [30:15] – James believes people should be eating more whole food omega 3’s especially wild salmon, shellfish, wild crab, wild lobster. However, due to the presence of persistent organic pollutants and mercury James limits his intake to twice a week and on other days he supplements with 4 grams of krill oil and 3-4 grams of fish oil. A recent clinical study showed that 4g of EPA significantly reduced cardiovascular events (by 25%) in population with cardiovascular risk factors. [32:55] – James also explains the benefits of using krill oil as krill contain a very high form of bioavailable astaxanthin, a keratinoid that krill get from feeding on micro-algae. This is not available in the same concentrations once seafood is cooked. James explains astaxanthin has numerous benefits, including preventing oxidative and thrombotive damage. [37:18] – Keratinoid didn’t work with beta-carotene and it doesn’t work for preventing heart attacks and increases the risk of lung cancer but James explains how the carotene keratinoid such as beta-carotene, alpha-carotene and lycopene are completely different to xanthophyll keratinoid such as astaxanthin. [40:22] – For clinical benefits such as lowering blood pressure and stabilising plaque, James recommends a 3.5-4g target dose of EPA and DHA. This also ensures you are getting a good amount of bioavailable choline per day. [43:37] – Are there concerns with fish oil enhancing the thinning of blood for people on blood thinners? James explains studies show that there are no clinically significant bleeds that are increased, only minor bleeds. [46:11] – James recommends people go test their omega 3 index (a blood test) as most of us are very deficient. Optimal amount seems to be up to 13% and at a minimum 8%. [47:41] – The problem with trying to get omega 3 and astaxanthin through seafood alone, without the use of supplementation is the environmental toxins and the reduced bioavailability of astaxanthin of cooked seafood. There are concerns over toxicity and oxidation as 50% of fish oils on the market have problems with oxidation. Tips: use a wild source, where it’s sourced matters (Alaska or Canadian waters are cleaner), certificate testing oxidation should be less than 5%. James takes Life Extension fish oils and stores it in the freezer. [50:34] – James loves eggs from pastured hens which have xanthophyll keratinoids but considers farmed factory eggs to be omega 6 bombs which oxidise when cooked. He believes 2-3 pastured eggs a day are a great way to get choline, healthy fats and protein and always cooks his eggs over easy to prevent oxidation and eats his with Ezekiel toast to bind persistent organic pollutants. [52:40] – So, are raw eggs better than cooked? James believes this is a balance. Animal studies show raw milk seems to produce a healthier animal and could have benefits over cooked milk. The same could potential apply to egg but there is the contamination issue to consider (which is probably over emphasised). [54:27] – The difference between grass fed and factory raised animals is that the fat will be healthier. James explains the refined grains dramatically increase the omega 6 content in the fat. Pastured animals get keratinoid and other benefits from consuming the grass. [56:28] – For people on a budget, James recommends going for pastured eggs and build up your antioxidant levels by taking krill oil. [1:01:35] – Unless you are an expert, vegan diets can be very dangerous. This is because we are eliminating food groups that provide essential nutrients that can be difficult to get. For more good vegetarian options high in omega 3, however, nuts, chia, flax and hemp hearts, leafy greens are also good. Also, algae oil for the marine omega 3. [1:05:22] – To pre-order James’ new book: Superfuel visit Amazon, it comes out on November 13. James also started his own YouTube channel and you can follow him on social media: Facebook, Twitter or Instagram. I think he means: butter made of milk from pasture raised cattle. Excellent Podcast. Lots of value on this one. Thanks for delivering an EPIC episode. I believe Ketogenic food choices are far healthier than LFHC and lead toward agreement with the general concepts, yet these are lots of theories and claims; very weak on specifics or clear good science. A study does not mean science. The complexity of all the interactive variables are huge. The Reduce-It study was NOT 4 grams of “Fish Oil”. The Reduce-It study was 4 grams of >98% highly purified EPA, eicospentanoic acid (originating from phytoplankton, collected from fish under 100% nitrogen and then highly purified from all the dominant other fats), vs. 4 grams of mineral oil per day in a population already taking a statin (at whatever dosage or efficacy in reducing unmeasured LowDensityLipoprotein particles, the primary driver of atherosclerosis as first published 08/011960: https://goo.gl/Eu3tzQ).